Ranveer Singh, the Man who is at ease in almost 'everything'! Fashion and Beauty Ranveer Singh, the Man who is at ease in almost ‘everything’! Ranveer Singh, the Man who is at ease in almost ‘everything’! When it comes to Bollywood actors, their dressing sense is counted in the top style league, but there is this one man with a league of his own. His name is Ranveer Singh. Right now he is the most talked about actors in Bollywood. He is not just a vibrant actor but also is an eye catching dresser. Some people dress for occasions, but for some people life is a live costume party! Ranveer Singh is one of them! There are not many men in Bollywood who carry the confidence up the sleeves as Ranveer Singh. In the 90s, Govinda was the one whom we called the ‘Lal Peela’ actor and now Ranveer is the new colorful actor in Btown. Any article on Ranveer is incomplete without his Bae Deepika Padukone and without talking about the way he was dressed! 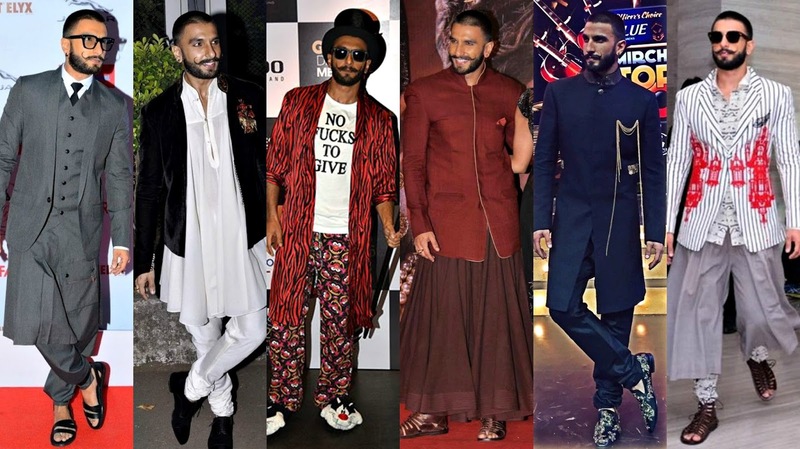 Be it a printed outfit or any quirky look, Ranveer Singh can turn any weird outfit into a new fashion trend. Here are some examples of that. We can say the suit is catchy, but the glasses and extra shiny shoes could have gone horribly wrong if it was not Ranveer Singh. Alas! Ranveer Singh gives us the message that it is your confidence that matters to carry any look you want! Who on earth would have thought of that look for an event? 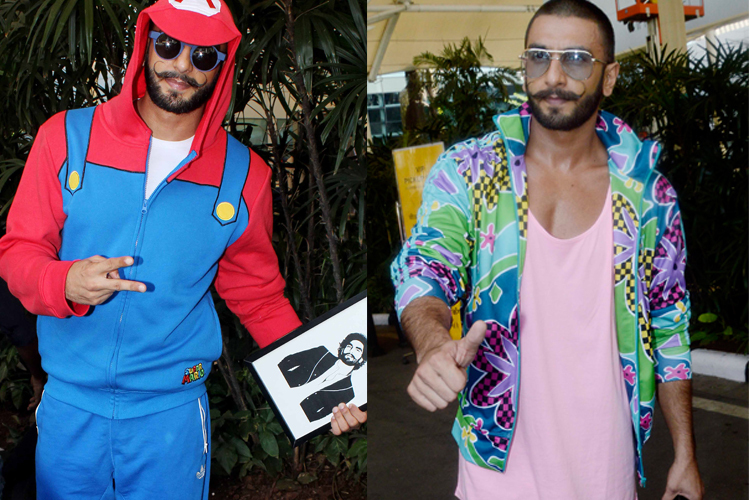 It looks like Ranveer has his own taste and he is not afraid to flaunt his weirdness. A printed shirt with those traditional pants, can anyone else pull off this look? Well this is just another shade of Ranveer. Look at him whacking it up! Airport attire was never so outrageous and pinky! But our Ranveer, blends it all so well! Can you name one actor who could still look manly with these Pyjamas? One of his casual avatars, a flowery suit and hat, he is killing the summer look. The pastels of English colors, hues of blue and peach maybe considered girly colors. But here we have Ranveer, comfortable posing in these peaceful hues! That hat is the killer! Another of his airport outfits! The paparazzi went crazy when Ranveer emerged out of the airport wearing this Mario hoodie paired with a matching Adidas track pant! Well, doesn’t he look adorable in this outfit too? This hipster of Bollywood redefines confidence and comfort in a whole new way. To all men and women out there, this is what Ranveer Singh is shouting out loud – ‘Wear what you want and it is your confidence that will define you better. Be confident and flaunt everything you wear.‘!